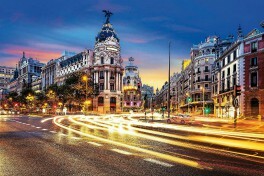 We arrive in Madrid, Spain's capital and largest city. On arrival, we will be transferred to our hotel. This afternoon, we enjoy an orientation tour of Madrid, with all its skyscrapers along Castellan Boulevard, the famous Las Ventas Bullring, the 100-year-old Gran Via, Plaza de Espana, colon and the 18th century area around Prado Boulevard. Dinner is at our own expense. The Hotel Boutique Posada del León de Oro is in the Madrid City Center, in La Latina neighborhood, perfect both for leisure holidays and business stays: a stone's throw from the emblematic monuments of the eternal city and from the most known shopping areas, very close to Puerta del Sol and Plaza Mayor. We drive to Toledo with our guide. Known as the museum city, Toledo has a colorful mixture of Spanish & Arab-influenced cultures. We will visit Santo Tome Cathedral and discover the magnificent art of Damasquinado, one of the treasures of Spain inherited during the era of Arab dominance in the 7th century. In the afternoon we head back to Madrid for free time before we transfer to the Mercado de la Reina for a taste of Spanish nightlife and Madrid's famous tapas. We board the fast train to the Moorish-influenced city of Cordoba with its mix of Roman, Arabic and Spanish history. We transfer to our hotel before meeting our guide for a leisurely walking tour through the streets of Cordoba, including visits to Cordoba Mezquita, a cathedral converted from an original mosque. Tonight a delicious dinner is included at the Bodea Mezquita. Our newly renovated hotel is a quaint building reflecting the typical style of the second half of the 19th century. Here our guests will find a wonderful combination of the charm of the past and all the amenities of modern times. The hotel “La casa de los naranjos” is located in the heart of Córdoba’s historic downtown district which Unesco declared worldcultural heritage of mankind. Many famous sights are located close to our hotel; for example: Christo de los Faroles, Palacio de Viana palace museum, El Palacio de la Merced, or Santa Marina and San Andres churches. Fabulous Judería, the the city’s Jewish neighborhood, lies within walking distance. The commercial center of the city featuring lots of shopping facilities is just a few minutes away, as well. We travel to Seville by coach. 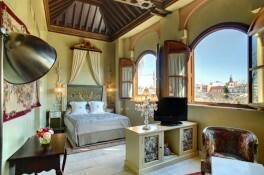 Seville is a grand city steeped in Moorish history with charming cobbled streets and beautifully colored tiled patios. Early in the afternnon we meet our guide for a trolley bike ride through the cobbled streets with visits to Maria Luisa Park and the fabulous Plaza de Espana. We will also visit Alcazar and the cathedral. This former SXVIII sacristy, now converted into a three-star hotel with 23 rooms, is located in the historic center of Seville, La Alameda de Hércules. Very well connected by car and bus, and 5 minutes walk from the center. The Alameda de Hércules is the biggest walk in Seville since the 16th century. A fashionable area where all the baroque classicism of the city mixes with the avant-garde tendencies of Seville. The day is for you to spend at leisure. Enjoy dinner at a local restaurant. After breakfast, we head to Jerez, home to the world-famous Spanish horses. Here we will enjoy a fabulous show at the Royal Horse School, later learn about vineyards and wine production, a well-known industry in the region. We will visit a local cellar for a tour and tastings, then head back to our hotel. This evening we enjoy a guided walk to Santa Cruz including a demonstration of Spanish Flamenco. A beautiful drive this morning beginning with a steady climb into the mountains. We arrive in time for lunch (at own expense) before embarking on an afternoon tour to visit the Alhambra Palace and Generalife Gardens. Later we stroll around the Albaicin area, reminiscent of a small Arab town en-route to Templo del Flamenco for dinner and a flamenco gypsy show. Among all the artistic whole stands out an exquisite Nazarí capital carved in alabaster, which makes it a piece unique in the world. On the columns supporting wooden beams supporting the sixteenth century that the first and second floors. From the main bright courtyard there is an access to all parts of this fully equipped, and a special room which overlooks the Alhambra. The Hotel Casa del Capitel Nazarí is an ancient Renaissance palace built in 1503 and located in the picturesque area of the Albaicin, in front of the Alhambra in Granada and in the city centre, close to the cathedral. It is a palace with lintels and Tuscan columns, Corinth capitals, Arabic chromium-plated beams; Renaissance decorated wooden ceiling and two Roman columns. 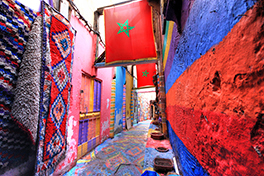 We fly today to Morocco and the glorious city of Marrakesh. A delicious welcome and show is included tonight at the Ksar AlHamra Palace. At the heart of the Medina district, Riad Slitine enjoys an ideal location, close to historical sites and a 2-minute walk from the souks and Jamaa el Fna (UNESCO World Heritage Site). The property offers its guests five sumptuous patios and a rooftop terrace, blooming with masses of white roses and palm, orange and banana trees. All this atmosphere has recently allowed the Riad Slitine to serve as a backdrop for movie sequences and commercials! This place is a haven of peace where well-being and tranquility are combined wonderfully. breathtaking views of the rooftops of Marrakech, solarium, swimming pool. And for your relaxation, hammam, massages and beauty treatments allow you to live exceptional moments. Today we enjoy an exception experience with our host, who is a famous Moroccan chef. From picking out fresh produce to sampling spices for the perfect flavor, to exploring the local food market, our check will unlock the secrets of his recipes. After our cooking demonstration and lunch, we head to Les Bains de Marrakech for an afternoon at the spa. Afternoon and evening is at leisure. Our guided tour starts with the Majorelle Gardens and the Koutoubia Minaret built in the 12th century. 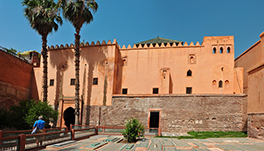 We then visit the Bahia Palace and Saadian Tombs [photo at right]. After lunch we will embark upon a deep exploration of Medina, with its vast array of shops and kiosks. A highlight of our tour will be a visit to a women's cooperative located inside the ancient walls. We will be able to see and purchase the work the women produce to support the community. We leave Marrakesh this morning and head north to the renowned city of Casablanca. The city is the largest and most populated city in Morocco, with its busy port, which accounts for more than half of the country's industrial output. The atmosphere is more cosmopolitan than elsewhere in Morocco, with Western dress and fashions predominating. We will tour the city visiting the central market, the Royal Palace, Mohamed V Square and a stop outside the Hassan II Mosque. After lunch we continue north to Rabat, known as "the white Imperial City." We visit the Royal Palace, the Oudaya Kasbah [photo at left] and the Mohamed V Mausoleum before arriving at our Riad for the evening, including a relaxing dinner with our hosts. We travel by coach to the Imperial city of Meknes, where we will tour the quiet winding streets of the medina. Our local guide will show us El Hdim Square, Bab El Mansour, the massive gate which is the entrance to the old city and the Jewish quarter. After lunch we continue to the holy town of Moulay Idriss and Volubillis, famous for its magnificent Roman mosaics. Most of the visible ruins date back from the 3rd century BC. From here, we travel to our final destination, the ancient city of Fes. Located in the Old Medina, Riad Palais Ommeyad is a traditional palace with Moroccan décor featuring an outdoor swimming pool, spa bath, massage and body treatments. Karaouiyne Mosque is a 20-minute walk away. All suites are air conditioned and offer views of the pool, satellite TV, laptop safe box and separate seating area. The private bathroom includes a bathtub, free toiletries and bathrobe and slippers. A Moroccan traditional breakfast is available. Guests can also sample local and international specialties upon request. Our first stop is at Morocco's largest royal palace for a guided tour, including a demonstration of the art of traditional mosaic making. We then venture deep into the largest medina in the world to see the tanneries, artisan quarters and the souks for an afternoon of browsing and bartering. After dinner, we transfer to the airport for our flight back to North America. Airfare Round Trip from New York, JFK is not included. Deposit is $500 pp, double or single. Deposit is Due April 15, 2019. Full Balance is due no later than July 15, 2020. Make your check or money order payable to Aviva Travel Group. OR to pay by credit card, fill out your information on the registration form and email to Ruth Bridges, avivatravel@aol.com, or fax it to 1-630-559-8445.